(PantherMedia / Edwin Wodicka) People who are sensitive to lactose need to read the labels on food packaging very carefully. Read on to find out what to watch for when shopping and how much lactose is found in different foods. the nutritional content and calories. A list of all the ingredients according to their percentage of the total weight, in descending order: The main ingredient is at the top, and the ingredient found in the smallest amount is listed at the bottom. A list of all additives, such as emulsifiers, preservatives, coloring and flavoring agents. Labeling of allergens: There are particularly strict regulations concerning the labeling of the main ingredients that can cause allergies or sensitive reactions. Currently, 14 substances and products must be labeled as potential allergens. These include things like soy, wheat, eggs, milk, peanuts, almonds and walnuts. Such ingredients have to be specifically highlighted by using a different typeface, text style (e.g. bold type), or background color. It is enough to indicate that a product contains milk or lactose, without specifying the exact amount. If you have any typical lactose intolerance symptoms after eating food you have previously not had any trouble with, it is worth checking the list of ingredients. Manufacturers sometimes change their product recipes. Lactose content changes when fruits are added. Fat content is also important: A high amount of fat means a lower amount of lactose. Some manufacturers use terms like "lactose-reduced" and "lactose-free" in their advertisements. The usage of these terms is currently not regulated by law. 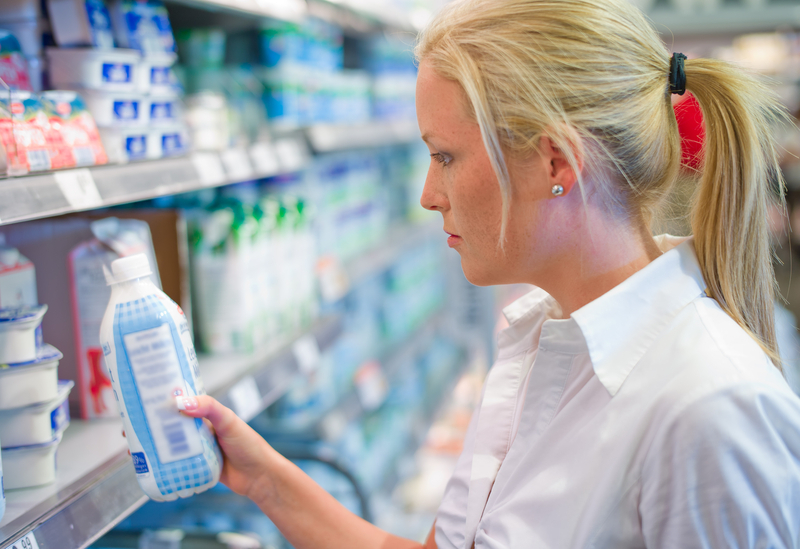 A product containing less than 0.1 g of lactose per 100 g may be called "lactose-free." Looking for the words "lactose-free" can save you the trouble of first checking the list of ingredients. But because these terms aren't legally protected, products that don't contain any lactose naturally may be labeled as lactose-free for promotional purposes. There may be other, identical products without this label that are less expensive. In Europe, the EU Food Information Regulation specifies that companies must also provide information specifically on allergen content when selling unpackaged food. Unpackaged foods might include things like cake from a bakery, a sausage from a deli, or a restaurant meal. The information may be communicated in written form, such as on the menu or a separate information sheet. They can also be provided verbally. It may also be provided in electronic form, for instance on the business's website. So it may be worth looking out for the product information you need or asking in the bakery or restaurant. You can find more information on food labeling on the German Federal Ministry of Food and Agriculture website. American Heart Association (AHA). Understanding Food Nutrition Labels. March 06, 2018. Bundesministerium für Ernährung und Landwirtschaft (BMEL). Allgemeine Kennzeichnungsvorschriften: Allergenkennzeichnung ist Pflicht. December 12, 2014. Bundeszentrum für Ernährung (BZfE). Lebensmittel: Allergenkennzeichnung. August 09, 2017.